The members of the Johnson County Board of Education are an invaluable resource to Johnson County as local leaders working for our children. I know firsthand of their focus and determination to provide every child an equal opportunity education. They hold a great responsibility that involves complicated assessments and considerate decision making while at the same time burdening themselves with improving test scores, school facility safety concerns and countless other issues. When members of the Johnson County Board of Education advocate for better funding, they are doing it for the children of this community: for the up-to-date books they need for their classes, for the after-school programs that help struggling readers, for new school buses to safely transport them, for buildings that offer the physical settings needed to create a positive learning environment, for course offerings and technology that will enable them to graduate to a career or go on to postsecondary education. Whatever the reason these men serve Johnson County Schools, they all know that these students hold our futures in their hands and the educational opportunities received today will shape generations to come. That is why they sacrifice their time and effort in support of our students and why they deserve our thanks during Kentucky’s January observation of School Board Member Recognition Month. 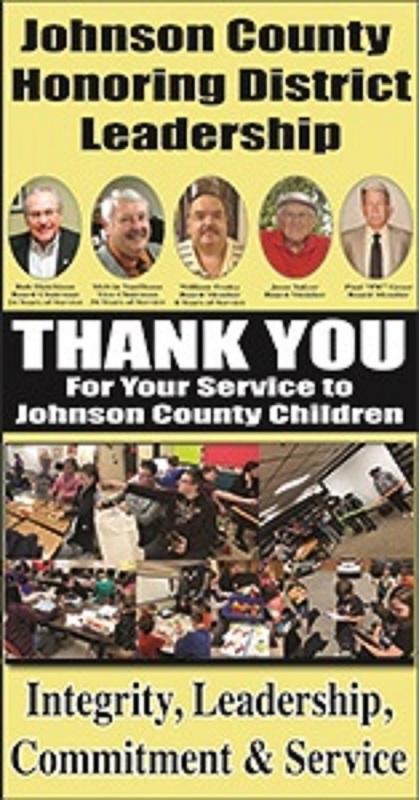 I, along with the students and staff of the Johnson County School System, wish to express our thanks and gratitude to Johnson County school leaders: Chairman Bob Hutchison, Vice-Chairman Melvin VanHoose, William Fraley, Paul Greer, Jesse Salyer, along with our departing members, Bruce Aaron Davis and Brad Frisby, for their commitment and concern for the futures of our children and I invite all Johnson County residents to join us in showing our appreciation to these outstanding public servants. Copyright © Johnson County Schools 2019. All rights reserved.